(Macao, Dec. 18, 2018) – Sands China Ltd. recently held three professionalism training and national education events for its team members, as part of the company’s efforts to build team members’ professionalism and deepen their understanding of national development and the Greater Bay Area. Winners of last month’s Because We Care Team Member Awards were invited to enjoy the drama “Confucius 63 Revisited (Macao)” at The Venetian Theatre Nov. 24-25, with an aim to enrich team members’ interest in Chinese culture. The original production features actors from Guangdong, Hong Kong and Macao, and is based on the real history of Confucius, telling some rarely known stories from his life. Its theatre runs in 2016 and 2017 were warmly received by audiences in Hong Kong. On Dec. 4, team members attended a seminar on the fundamentals of protocol at The Venetian® Macao, led by Daniel Fung Sio Weng, the former director of the Macao government’s Protocol, Public Relations and External Affairs Office. The seminar aimed to strengthen team members’ knowledge of protocol in Chinese-foreign affairs, Macao affairs and external affairs, allowing them to enhance the level of their professionalism and familiarise themselves with receiving delegations and guests. 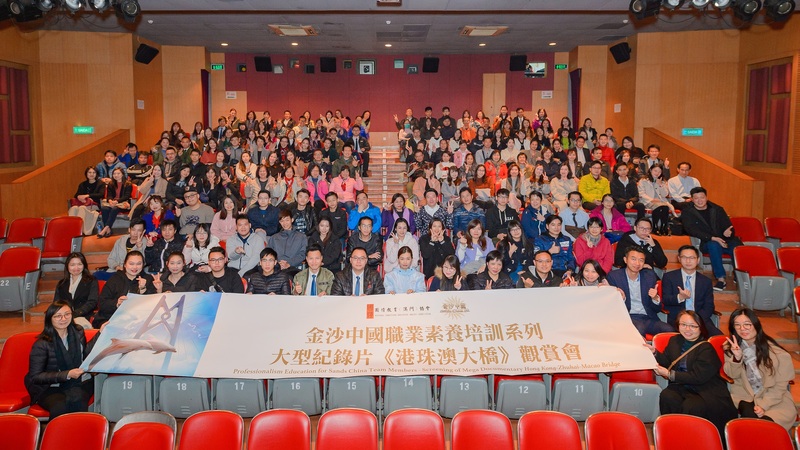 On Dec. 14, team members viewed a screening of the two-part documentary “Hong Kong-Zhuhai-Macao Bridge” at Cinema Alegria – the first time an integrated resort operator has organised such an activity at the historic local theatre. The large-scale film was jointly produced by the CCTV Science and Education Channel, the Hong Kong-Zhuhai-Macao Bridge Authority, Discovery Channel, Guangdong Radio and Television, and Zhuhai Television. It vividly tells the story of the Hong Kong-Zhuhai-Macao Bridge and the huge economic and social impact it is expected to bring. Team members learned about the bridge’s design concept, artificial islands and undersea tunnel, and about some of the world’s leading technologies that went into the construction of the bridge. They also became aware of some of the challenges of the engineering mega project, such as geography, maritime and aviation restrictions, typhoon resistance, and the efforts to minimise impact on Chinese white dolphins. Sands China has long strived to enhance the professional skills of its 28,000 team members through various means. Besides its professionalism training events, the company has banner stands at its properties and video screens showing a professionalism education documentary series in order to raise team members’ awareness and understanding of professionalism education. 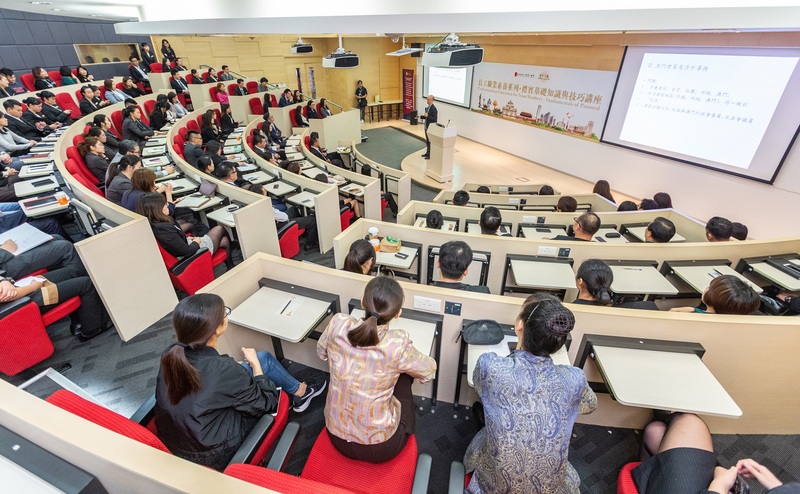 In addition, the company's Professionalism Training for Gaming Practitioners programme, co-organised with the Labour Affairs Bureau (DSAL) and the Macau Federation of Trade Unions (FAOM), was launched in July 2016 and has since trained nearly 4,000 team members to date. The company targets to train a total of 7,500 team members during the first five years of the programme. Photo caption: Sands China team members attend a seminar on the fundamentals of protocol Dec. 4 at The Venetian Macao. The session was led by Daniel Fung Sio Weng, former director of the Macao government’s Protocol, Public Relations and External Affairs Office, to strengthen team members’ knowledge of protocol in Chinese-foreign affairs, Macao affairs and external affairs. Photo caption: Sands China team members view a screening of the documentary film “Hong Kong-Zhuhai-Macao Bridge” Dec. 14 at Cinema Alegria. The large-scale, two-part documentary tells the story of the Hong Kong-Zhuhai-Macao Bridge and the huge economic and social impact it is expected to bring.